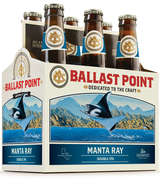 We've developed many IPA recipes in our R&D program, but right from the tank, our Manta Ray Double IPA was a winner. Aromas of fresh, citrusy tangerine, melon and light pine leap from the beer and linger over a smooth finish. Like its namesake, this brew can sneak up on you - a big beer without a bite.